In addition to being a humanitarian nightmare, the on-going Syrian conflict has wreaked havoc on the country’s economy. And the damage to both human capital and infrastructure could keep economic growth muted going forward — even if the conflict ends within a few years. Operating under the assumption that the conflict will continue on for “several more years,” a BMI Research team forecasts that the Syrian economy will contract by an average of 3.9% annually from 2016 to 2019. This will drag down the beleaguered economy to its early-1990s size. “Large-scale destruction amid the protraction of the current civil war will continue to damage the Syrian economy over the coming decade,” the BMI Research team argued in a recent report. 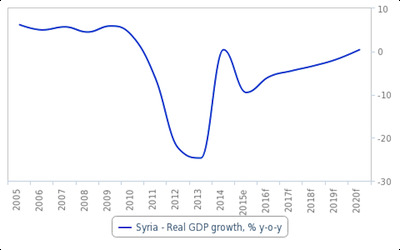 UN, BMI ResearchSyria’s real GDP growth, per cent changed year-over-year. Since 2011, all of the components of Syria’s GDP have plunged — with serious drops in manufacturing and agriculture. 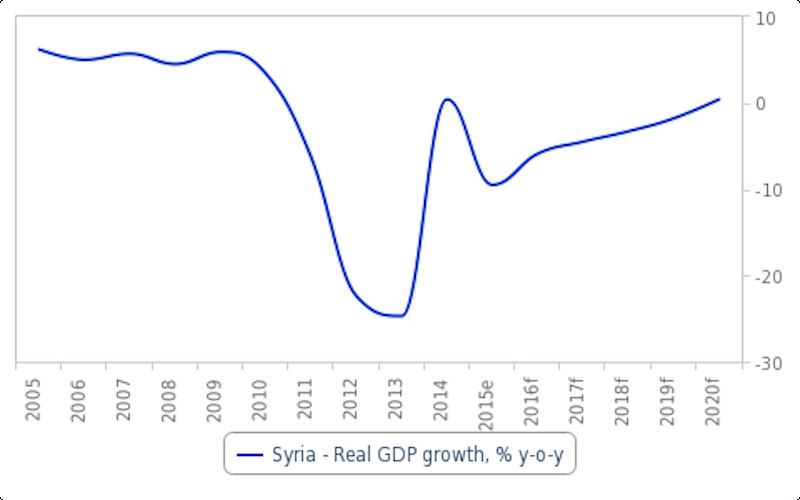 The chart shows the stunning drops in Syria’s GDP growth rates, including the estimated 25% contractions year-over-year in 2012 and 2013. Exports have lost 80% of their real value from 2010 to 2015, according to BMI’s estimates. Plus, oil output has dropped significantly in recent years, given that many oil fields are under the control of ISIS — aka the Islamic State, ISIL, or Daesh. And that’s significant because, although Syria was not one of the world’s biggest oil producers, the commodity still accounted for about 50% of its exports and about 30% of the government’s revenue in 2010. “We do not forecast a recovery in exports before 2021, as transportation infrastructure will take time to rebuild,” the BMI team argued. 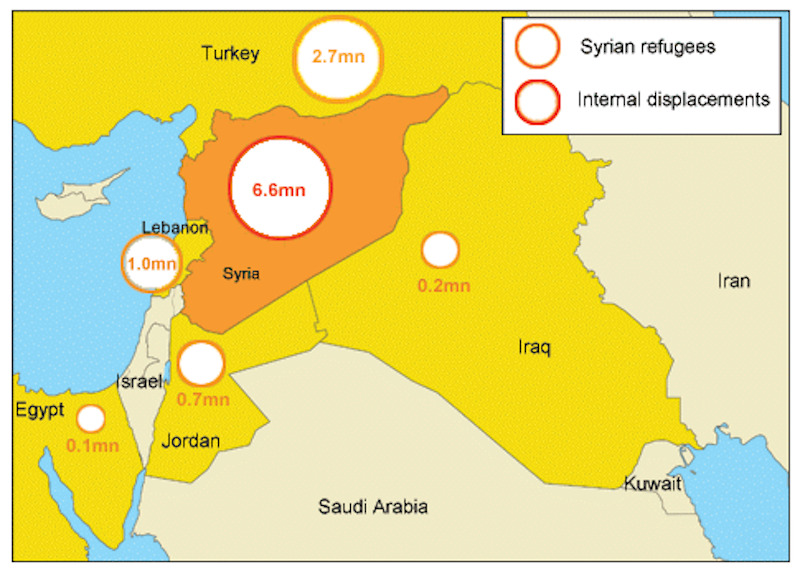 D-maps, BMI ResearchSyrian refugees in the Middle East and internal displacement. Another huge, long-run economic problem facing Syria is the demographic catastrophe caused by the war. The country’s pre-war population was around 22 million, but an estimated 4.8 million refugees have left the country to date — a number that’s equal to about 22% of that initial population. Moreover, about 6.6 million refugees have been displaced within Syria, according to an estimate by the International Displacement Monitoring Centre. Another extremely scary statistic for the long run is that an estimated 4 million Syrian children are not currently in school. Anecdotal evidence suggests that economic conditions have rapidly deteriorated in government-held areas, which were relatively insulated at the beginning of the conflict. Nevertheless, we still expect regional disparities to persist, with regime-controlled areas faring relatively better than rebel-held areas. […] We expect greater economic devastation in territories controlled by rebel groups and IS. Since the beginning of Russian intervention in September 2015, frequent airstrikes have targeted rebel-held areas, resulting in large-scale destructions of infrastructure. According to UN estimates, almost 600,000 people live in besieged areas — mostly in regions controlled by opposition forces — translating into rapid impoverishment. Despite the proclamation of a caliphate and the provision of aid and electricity, IS will also fail to develop sustainable economic institutions. The elimination of any resistance will continue to alienate the local populations and cause an exodus. In addition, offensives against IS in the region of Raqqa will likely result in further damage to infrastructure. In sum, Syria’s economy has been seriously damaged by the conflict — and it’s highly unlikely that there will be a quick fix.